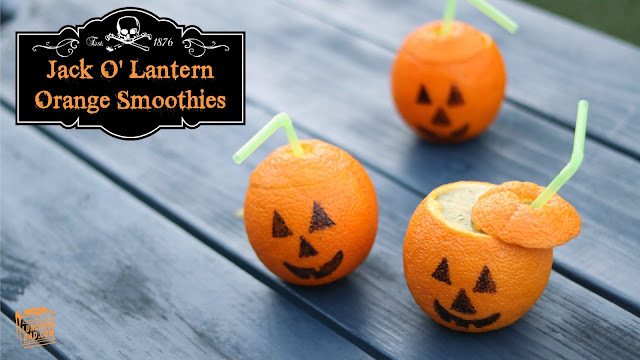 Lunchbox Dad: How to Make Easy Jack O' Lantern Orange Smoothies for Halloween! How to Make Easy Jack O' Lantern Orange Smoothies for Halloween! When I say that my kids loved a recipe, I don't throw that word around lightly. We recently created this smoothie idea and my kids couldn't get enough. They literally kept asking for more! That is why I had to hare it with you, especially with Halloween almost here. As parents, we are always looking for easy and healthy recipes that our kids will actually eat. This is one of those recipes. In fact, it is designed for Halloween but really can be served all year round, just skip the step on making it into a Jack O' Lantern. The ingredients are listed below and I've also made a video with all of the instructions. Have a safe and fun Halloween! Makes three smoothies, but you can adjust the ingredients for more. Ingredients: 3 oranges, 1 cup vanilla yogurt, 1 cup spinach, 2 cups frozen mango, black marker, green straws.